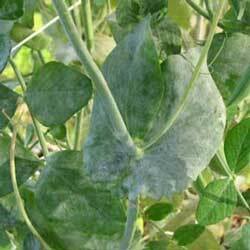 Powdery mildew is a destructive tomato disease that also affects other plants. The disease doesn't kill the plant but causes decreased plant health and loss of tomato fruit production by up to 50%. Other susceptible vegetables include melons, pumpkins, squash, cucumbers, beans, and peas (see photos). Light green to yellow spots or splotches on the upper surface of the leaves. Initially, spots appear as 1/8-inch to 1/2-inch in diameter. The fruit doesn't show symptoms, only the leaves. 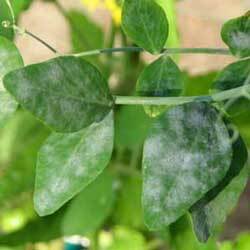 As the disease progresses the spots and leaves turn yellow and the leaves wither and fall off. Dry leaf surfaces and cool temperatures encourage development. Infected rosemary has been implicated as a source in tomatoes. It's more common in greenhouses because the leaves stay drier. Epidemics have occurred under dry conditions. Many types of plants can host the disease and carry it from season to season. The disease is spread by windborne fungus spores. In greenhouses high relative humidity discourages the disease. Plant tomatoes in sunny locations as cool, shady spots encourage spread. Allow good air circulation by pruning excess foliage. Plant your tomatoes in warm, dry, sunny spots. Spraying with chemical contact fungicides is effective. Begin treatments as soon as you notice the problem and spray all plant surfaces. Contact fungicides to help prevent spread include mineral oils (JMS Stylet Oil) and potassium bicarbonate (Armicarb, MilStop, and Kaligreen). Repeat applications at five day intervals. Systemic fungicides proven effective are Quadris, Flint and the demethylation inhibitor Nova. However, if you don't notice any improvement discontinue use as the disease may have developed resistance.